Professional roofers see many kinds of roof problems. Sometimes the cause is obvious, other times a bit of detective work is needed to track water back to its source. But there are some more common roof problems that create the kind of roof leaks that we see most often. Roof flashing is made of metal or plastic and is added to the roof around openings or where two sections of the roof come together. Flashing is typically found above doors, windows and other wood trim on the outside of the house. Flashing also is placed around chimneys, dormer windows and vents. Leaks can occur when holes are created by rust or damage from debris. Over time, metal flashing can become badly corroded. Some small holes can be patched, but badly corroded flashing should be replaced. Most homes have shingles on the roof. Shingles are the top-most layer of protection for your home and are available in many colors and styles. Over time, shingles can wear away or become damaged by hail, high winds, falling tree branches and hot summer sun. When damaged, the shingles may curl up, crack or split. If you see granules from your shingles on the ground below your roof line, that is a clue that your shingles may need to be replaced. Roof vents are used to allow air to enter and exit into the attic or other ventilation areas. Vents are important because they provide the air exchange need to keep your attic properly insulated. Some roof vents look like small pipes coming out of the roof, others have twirling turbines on the top or are ridge vents located along the edges of the roof. Roof vents can create leaks if they are not properly installed, but sometimes the screws used to install them can rust or come loose. in addition, the vent itself can become cracked if it is plastic, or separate at the seams if it is metal. Clogged or damaged gutters is a common roof problem that can cause a leak. 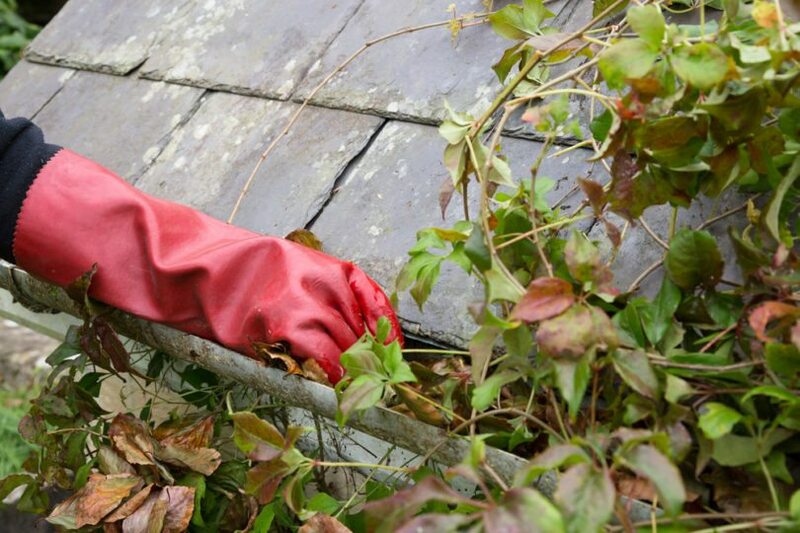 Even when cleaned regularly, gutters can become clogged quickly after a storm or at the change of seasons. Gutters are designed to take water away from the home’s structure. But if it becomes clogged, the water can be trapped and overflow up against the roof edge. Over time, this water can create mold or get under the shingles and damage the plywood underneath. Skylights add beauty to the home, but they can also leak. Generally, leaks are caused either by decay or corrosion around the edges of the skylight, or by improper installation. Sometimes water stains on the ceiling near the skylight can indicate a problem with the flashing. If you have a leaky roof, call DUBO Roofing. We will inspect your roof to determine the cause of the problem and give you an estimate on repairing it. You can also contact us online to request an estimate to repair your roof problems. ← Hurricane Season is Heating Up – Is Your Roof Ready?